For Freikorps units that started the German war against Czechoslovakia, see Sudetendeutsches Freikorps. Freikorps (German: [ˈfʁaɪˌkoːɐ̯], "Free Corps") were German military volunteer units that existed from the 18th to the early 20th centuries, which effectively fought as mercenary or private armies, regardless of their own nationality. In German-speaking countries, the first so-called Freikorps ("free regiments", German: Freie Regimenter) were formed in the 18th century from native volunteers, enemy renegades and deserters. These sometimes exotically equipped units served as infantry and cavalry (or more rarely as artillery), sometimes in just company strength, sometimes in formations up to several thousand strong; there were also various mixed formations or legions. The Prussian von Kleist Freikorps included infantry, jäger, dragoons and hussars. The French Volontaires de Saxe combined uhlans and dragoons. 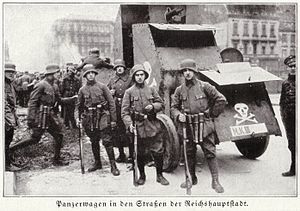 In the aftermath of World War I and during the German Revolution of 1918–19, Freikorps consisting largely of World War I veterans were raised as right-wing paramilitary militias, ostensibly to fight on behalf of the government against the Soviet-backed German Communists attempting to overthrow the Weimar Republic. However, the Freikorps also largely despised the Republic and were involved in assassinations of its supporters. The very first Freikorps were recruited by Frederick the Great during the Seven Years' War. On 15 July 1759, Frederick ordered the creation of a squadron of volunteer hussars to be attached to the 1st Regiment of Hussars (von Kleist's Own). He entrusted the creation and command of this new unit to Colonel Friedrich Wilhelm von Kleist. This first squadron (80 men) was raised in Dresden and consisted mainly of Hungarian deserters. This squadron was placed under the command of Lieutenant Johann Michael von Kovacs. At the end of 1759, the first four squadrons of dragoons (also called horse grenadiers) of the Freikorps were organised. They initially consisted of Prussian volunteers from Berlin, Magdeburg, Mecklenburg and Leipzig, but later recruited deserters. The Freikorps were regarded as unreliable by regular armies, so they were mainly used as sentries and for minor duties. These early Freikorps appeared during the War of the Austrian Succession and especially the Seven Years' War, when France, Prussia and the Habsburg Monarchy embarked on an escalation of petty warfare while conserving their regular regiments. Even during the last Kabinettskrieg, the War of the Bavarian Succession, Freikorp formations were formed in 1778. Germans, Hungarians, Poles, Lithuanians and South Slavs, as well as Turks, Tatars and Cossacks, were believed by all warring parties to be inherently good fighters. The nationality of many soldiers can no longer be ascertained as the ethnic origin was often described imprecisely in the regimental lists. Slavs (Croats, Serbs) were often referred to as "Hungarians" or just "Croats", and Muslim recruits (Albanians, Bosnians, Tatars) as "Turks". Because, with some exceptions, they were seen as undisciplined and less battleworthy, they were used for less onerous guard and garrison duties. In the so-called "petty wars", the Freikorps interdicted enemy supply lines with guerrilla warfare. In the case of capture, their members were at risk of being executed as irregular fighters. In Prussia the Freikorps, which Frederick the Great had despised as "vermin", were disbanded. Their soldiers were given no entitlement to pensions or invalidity payments. In France, many corps continued to exist until 1776. They were attached to regular dragoon regiments as jäger squadrons. During the Napoleonic Wars, Austria recruited various Freikorps of Slavic origin. The Slavonic Wurmser Freikorps fought in Alsace. The combat effectiveness of the six Viennese Freikorps (37,000 infantrymen and cavalrymen), however, was low. An exception were the border regiments of Croats and Serbs who served permanently on the Austro-Ottoman border. Freikorps in the modern sense emerged in Germany during the course of the Napoleonic Wars. They fought not so much for money but rather out of patriotic motives, seeking to shake off the French Confederation of the Rhine. After the French under Emperor Napoleon had either conquered the German states or forced them to collaborate, remnants of the defeated armies continued to fight on in this fashion. Famous formations included the King's German Legion, who had fought for Britain in French-occupied Spain and were mainly recruited from Hanoverians, the Lützow Free Corps and the Black Brunswickers. The Freikorps attracted many nationally disposed citizens and students. Freikorps commanders such as Ferdinand von Schill, Ludwig Adolf Wilhelm von Lützow or Frederick William, Duke of Brunswick-Wolfenbüttel, known as the "Black Duke", led their own attacks on Napoleonic occupation forces in Germany. Those led by Schill were decimated in the Battle of Stralsund (1809); many were killed in battle or executed at Napoleon's command in the aftermath. The Freikorps were very popular during the period of the German War of Liberation (1813–15), during which von Lützow, a survivor of Schill's Freikorps, formed his Lützow Free Corps. The anti-Napoleonic Freikorps often operated behind French lines as a kind of commando or guerrilla force. Throughout the 19th century, these anti-Napoleonic Freikorps were greatly praised and glorified by German nationalists, and a heroic myth built up around their exploits. This myth was invoked, in considerably different circumstances, in the aftermath of Germany's defeat in World War I. Even in the aftermath of the Napoleonic era, Freikorps were set up with varying degrees of success. During the March 1848 riots, student Freikorps were set up in Munich. In First Schleswig War of 1848 the Freikorps of von der Tann, Zastrow and others distinguished themselves. In 1864 in Mexico, the French formed the so-called Contreguerrillas under former Prussian hussar officer, Milson. In Italy, Garibaldi formed his famous Freischars, notably the "Thousand of Marsala", which landed in Sicily in 1860. Even before the Franco-Prussian War of 1870/71, Freikorps were developed in France that were known as franc-tireurs. The meaning of the word Freikorps changed over time. After 1918, the term was used for the paramilitary organizations that sprang up around Germany as soldiers returned in defeat from World War I. They were the key Weimar paramilitary groups active during that time. Many German veterans felt disconnected from civilian life, and joined a Freikorps in search of stability within a military structure. Others, angry at their sudden, apparently inexplicable defeat, joined up in an effort to put down communist uprisings, such as the Spartacist uprising, or exact some form of revenge on those they considered responsible for the armistice. They received considerable support from Minister of Defence Gustav Noske, a member of the Social Democratic Party of Germany. Noske used them to crush the German Revolution of 1918–19 and the Marxist Spartacist League, including arresting and murdering Karl Liebknecht and Rosa Luxemburg on 15 January 1919. They were also used to defeat the Bavarian Soviet Republic in May 1919. On 5 May 1919, members of Freikorps Lützow in Perlach near Munich, acted on a tip from a local cleric and arrested and killed twelve alleged communist workers (most of them actually members of the Social Democratic Party). A memorial on Pfanzeltplatz in Munich today commemorates the incident. Provisional Freikorps armored vehicle in Berlin during the Kapp Putsch of March 1920. Freikorps also fought against the communists in the Baltics, Silesia, Poland and East Prussia after the end of World War I, including aviation combat, often with significant success. Anti-Slavic racism was sometimes present, although the ethnic cleansing ideology and anti-Semitism that would be expressed in later years had not yet developed. In the Baltics they fought against communists as well as against the newborn independent democratic countries Estonia and Latvia. In Latvia, Freikorps murdered 300 civilians in Mitau who were suspected of having "Bolshevik sympathies". After the capture of Riga, another 3000 alleged communists were killed, including summary executions of 50–60 prisoners daily. Though officially disbanded in 1920, some of them continued to exist for several years and many Freikorps' attempted, unsuccessfully, to overthrow the government in the Kapp Putsch in March 1920. Their attack was halted when German citizens loyal to the government went on strike, cutting off many services and making daily life so problematic that the coup was called off. A recruitment poster for the Freikorps Hülsen. In 1920, Adolf Hitler had just begun his political career as the leader of the tiny and as-yet-unknown Deutsche Arbeiterpartei/DAP German Workers' Party, which was soon renamed the Nationalsozialistische Deutsche Arbeiterpartei/NSDAP (National Socialist German Workers Party) or Nazi Party in Munich. Numerous future members and leaders of the Nazi Party had served in the Freikorps, including Ernst Röhm, future head of the Sturmabteilung, or SA, Heinrich Himmler, future head of the Schutzstaffel, or SS, and Rudolf Höß, the future Kommandant of the Auschwitz concentration camp. Hermann Ehrhardt, founder and leader of Marinebrigade Ehrhardt, and his deputy Commander Eberhard Kautter, leaders of the Viking League, refused to help Hitler and Erich Ludendorff in their Beer Hall Putsch and conspired against them. Hitler eventually viewed some of them as threats. A huge ceremony was arranged on 9 November 1933 in which the Freikorps leaders symbolically presented their old battle flags to Hitler's SA and SS. It was a sign of allegiance to their new authority, the Nazi state. When Hitler's internal purge of the party, the Night of the Long Knives, came in 1934, a large number of Freikorps leaders were targeted for killing or arrest, including Ehrhardt and Röhm. Historian Robert GL Waite claims that in Hitler's "Röhm Purge" speech to the Reichstag on 13 July 1934, he implied that the Freikorps were one of the groups of "pathological enemies of the state". Freikorps soldiers pictured during the Kapp Putsch of March 1920. Freikorps Lützow in Zossen in 1920. Sudeten German Freikorps in Czechoslovakia, 1938. Trapped in Thorensberg by the Latvian Army. Rescued by the Rossbach Freikorps. Occupied Munich following the revolution of April 1919. Rescued the Iron Division after an extremely long march across Eastern Europe. had Rudolph Hoess as a member. In French, the Freikorps are referred to as "Corps Franc." Starting in October 1939, the French Army stood up a number of Corps Franc units with the mission of carrying out ambush, raid, and harassing operations forward of the Maginot Line during the period known as The Phoney War (Drôle de Guerre). They were tasked with attacking German troops guarding the Siegfried Line. Future Vichy collaborationist, Anti-Bolshevik and SS Major Joseph Darnand was one of the more famous participants in these commando actions. In May of 1940, the experience of the Phoney War era Corps Franc was an influence in creating the Groupes Francs Motorisé de Cavalerie (GFC) who played storied role in the delaying operations and last stands of the Battle of France, notably in the defenses of the Seine and the Loire. On November 25 1942, in the immediate aftermath of the Allied Invasion of Vichy French North Africa the Corps Francs d'Afrique (CFA)(African Corps Franc) was stood up in French Morocco within the Free French Forces by General Giraud. Giraud drew the members of the all-volunteer unit from Moroccans of diverse religious backgrounds (Christian, Jew, and Muslim) and gave them the title of Vélite a name inspired by the elite light infantry of Napoleon's Imperial Guard who were named after the Roman Velites. Much of the Corps was drawn from Henri d'Astier de la Vigerie and José Aboulker's Géo Gras French Resistance Group which had been responsible for the Algiers Insurrection where the Resistance seized control of Algiers on the night of November 8 1942 in coordination with the Allied landings happening that same night. In taking over Algiers, they managed to capture both Admiral Darlan and General Juin which led to the Darlan Deal wherein Vichy French forces came over to the Allied side. Darlan was later assassinated by Fernand Bonnier de La Chapelle an early member of the Corps Franc d'Afrique. They functioned as the Free French equivalent to the British Commandos. The Corps Francs d'Afrique went on to fight Rommel's Afrikakorps in Tunisia with the U.S. 5th Army. They fought alongside the British 139th Brigade at Kassarine and Sidi Nasr where they famously conducted a heroic bayonet charge, facing two to one odds, against the Italian 34th Battalion of the 10th Bersaglieri near the mountain of Kef Zilia on the road to Bizerte, taking 380 prisoners, killing the Italian Battalion Commander, and capturing the plans for Operation Auslading. They participated in the capture of Bizerte in May 1943. For its actions, the Corps Franc d'Afrique was awarded the Croix de Guerre. The CFA was formally dissolved on July 9 1943, with its members and equipment forming the corps of the newly created African Commando Group (GCA) on July 13 1943 in Dupleix, Algeria, today seen as a forbear to the post war Parachutist Shock Battalions and the modern day 13th RDP. The GCA went on to fight at Pianosa, Elba, Salerno, Provence, Belfort, Giromagny, Alsace, Cernay, Guebwiller, Buhl, and the Invasion of Germany. ^ Haffner, Sebastian (2000). Defying Hitler. Picador. pp. 30–31, 33. ISBN 0-312-42113-3. ^ Heiden, Konrad (1944). Der Fuehrer: Hitler's Rise to Power. Boston, MA: Houghton Mifflin Company. pp. 21–22. ^ Heiden, Konrad (1944). Der Fuehrer: Hitler's Rise to Power. Boston, MA: Houghton Mifflin Company. pp. 23–24. ^ Heiden, Konrad (1944). Der Fuehrer: Hitler's Rise to Power. Boston, MA: Houghton Mifflin Company. pp. 88–89. ^ Max Hirschberg & Reinhard Weber. Jude und Demokrat: Erinnerungen eines Münchener Rechtsanwalts 1883 bis 1939. ^ Michael Mann, Fascists, Cambridge/New York: Cambridge University, 2004, ISBN 9780521831314, p. 153. ^ Mason, K. J.; Fielden, Philip (2007). Republic to Reich: A History of Germany 1918–1939 (Third ed.). Melbourne, Australia: Cengage Learning Australia. p. 28. ^ a b Waite, p. 131, 132. ^ a b Waite, p. 62. ^ Waite, p. 203, 216. ^ "Axis History Factbook". Retrieved 3 January 2009. Eley, Geoff (1990). "Conservatives and radical nationalists in Germany: the production of fascist potentials, 1912–28". In Blinkhorn, Martin. Fascists and Conservatives: The Radical Right and the Establishment in Twentieth-Century Europe. New York, NY: Routledge. pp. 50–70. ISBN 978-0-049-40087-0. Gerwarth, Robert (2008). "The Central European Counter-Revolution: Paramilitary Violence in Germany, Austria and Hungary after the Great War". Past & Present. 200 (1): 175–209. doi:10.1093/pastj/gtm046. Koepp, Roy G. (2010). Conservative Radicals: The Einwohnerwehr, Bund Bayern Und Reich, and the Limits of Paramilitary Politics in Bavaria, 1918–1928 (PhD). Lincoln, NE: University of Nebraska. This page is based on the Wikipedia article Freikorps; it is used under the Creative Commons Attribution-ShareAlike 3.0 Unported License (CC-BY-SA). You may redistribute it, verbatim or modified, providing that you comply with the terms of the CC-BY-SA.